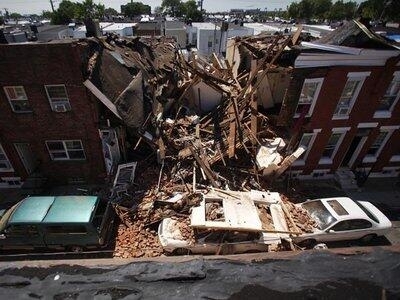 A natural gas explosion rocked a South Philadelphia neighborhood at around 11 this morning. The row house at 428 Daly Street was completely collapsed and the two neighboring homes were also damaged. A total of 8 people were injured; 4 adults infant, 2 children, and an infant. Seven were taken to Thomas Jefferson University Hospital and one was taken to Temple University Hospital. The house was vacant and was undergoing renovations. IT was a permitted construction site. PGW was quickly on the scene to turn off gas service. Fire officials currently have the scene under control, but officials need to figure out what happened. One of the injured was a private contractor who was working in the basement of the building. He told officials in the ambulance that he was working on the water heater before the explosion. That worker suffered extensive burns. A temporary shelter has been set up at Taggart Elementary School at 4th and Porter Streets for evacuated residents.